inscribed with title below image: Femme Sauvage de l’Île Van Diemen (Détroit de D’Entrecasteaux). 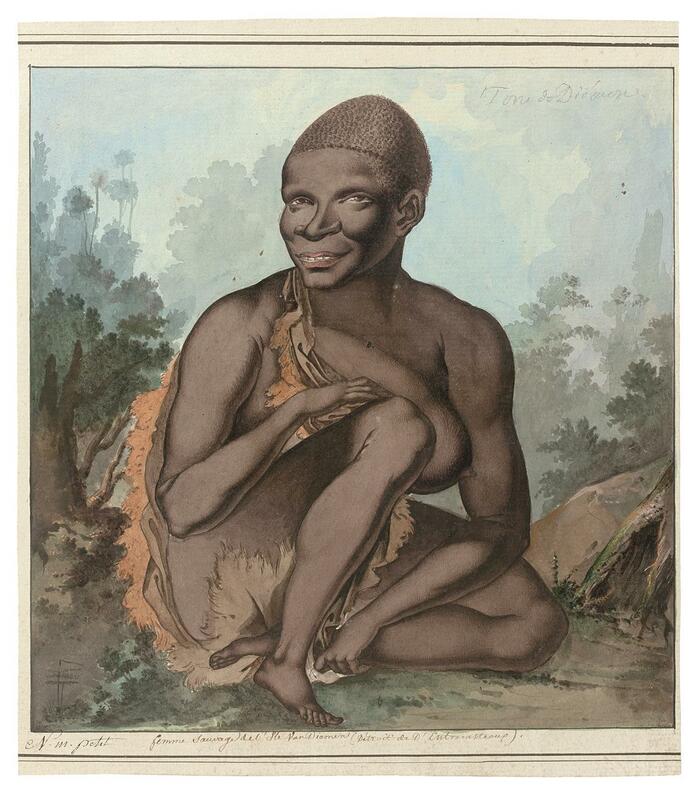 No full portrait, but very clearly related to the seated woman in plate XV (1807). It should be noted that the finished plated is noted as “Lesueur del.”, so clearly it was Lesueur who made the rather “stagey” arrangement of the finished plate using Petit’s original studies. A superb portrait of a seated woman in three-quarter profile, her legs crossed in the way noted by many of the French, with short cropped hair and a kangaroo skin cloak loosely draped over her right shoulder, her left breast exposed. She has no ornamentation, scarification nor jewellery. The portrait is one of only a handful that Petit did of women, which in itself is significant. Once again the location has been noted with some precision in the caption, which is an important detail because it means it is very likely she too was sketched near the French observatory in North West Bay (see discussion in note to drawing lot 6). Unusually for works from this series by Petit, the scene includes an accurate and quite evocative display of local foliage, the dominant brown and blue tones of which give the scene an extremely realistic feeling. The picture does have some unusual dimensional aspects which, it is presumed, is Petit’s way of trying to represent the way in which the French described the long, thin limbs of the Aboriginal people. No full portrait of this woman was ever published, but a simplified and rather generic version was added to the group scene published as plate XV in the first edition of Baudin’s voyage.